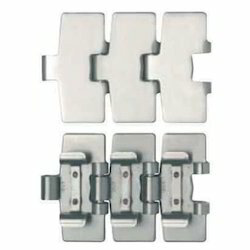 Offering you a complete choice of products which include single hinge 812 series straight running chains, double hinge 802 series straight running chains, single hinge ss slat chain, 881 tab series side flexing chains tab system, 881 series side flexing chains bevel system and 881 m series side flexing chains for magnetic system. We offer a range of premium quality Double Hinge 802 Series Straight Running Chains that are manufactured using best grade stainless steel. These chains are suitable for handling glass bottles, pet containers, kegs, crates etc. 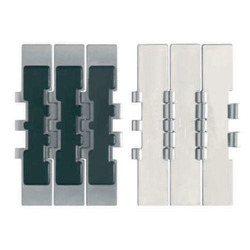 Further, our range is available in varied specifications and as per the customized requirements of clients. 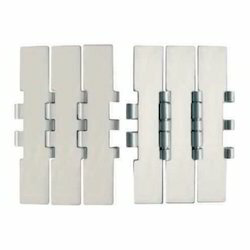 We offer a range of premium quality 881 Tab Series Side Flexing Chains that are manufactured using best grade stainless steel. These chains are suitable for handling glass bottles, pet containers, kegs, crates etc. We offer a range of premium quality Single Hinge Straight Running Chains that are manufactured using best grade stainless steel. These chains are suitable for handling glass bottles, pet containers, kegs, crates etc. 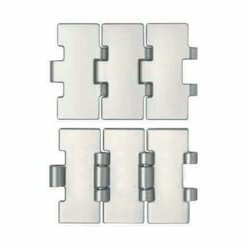 We offer a range of premium quality Single Hinge Straight Running Chains with Rubber Pads that are manufactured using best grade stainless steel. 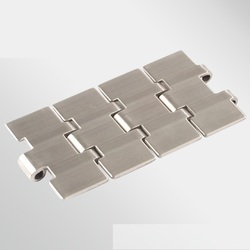 Looking for Stainless Steel Slat Chains ?